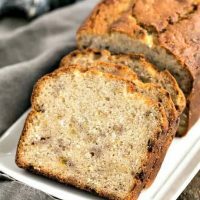 A classic moist banana bread with a buttermilk twist. Preheat oven to 350º. Grease and flour one 9 x 5 loaf pan. Cream butter and sugar with a hand mixer for 2 minutes. Add bananas, eggs, vanilla and buttermilk and mix to combine. Whisk together flour, soda, baking powder and salt in a clean bowl. Add to banana mixture. Mix until just combined (I like using a wooden spoon or spatula for this step) as quick breads should not be beaten or over mixed. Scrape the batter into the prepared pan. Bake 50-55 minutes, or until the bread pulls away from the sides of the pans and a toothpick inserted in the center comes out clean. Cool before slicing. To make optional topping, melt the butter in sauce pan, then add the sugar and milk. Cook until very syrupy, about 10 minutes. Remove from heat and add chopped pecans. Pour over bread, and spread across the top. Place under broiler, watching very carefully, until brown and bubbly. Adapted from The White Oak Restaurant on Buffalo Lake.